Former President Dr. A.P.J. Abdul Kalam, popularly known as Missile man, passed away after collapsing while delivering a lecture at the Indian Institute of Management, Shillong yesterday. His sudden demise has left a great vacuum in the country which can never be filled up. He was highly respected for his outstanding personality and humanitarian qualities. He graced the Indian Presidency for five years from 2002-2007. He became the 11th President of the country in July 2002 during the NDA Government; the head of state was seen to be the titular head who drew attention to himself and his office only when somber constitutional questions were thrown up in the aftermath of an uncertain electoral verdict particularly the hung Lok Sabha. For the rest, the President of India was to be wrapped and enclosed in dignified and ceremonial hauteur, acting on the aid and advice of an elected Government collectively responsible to the Lok Sabha. The people generally treated the President just a rubber stamp having no substantial powers. But President Kalam proved all these assumptions wrong and gave a new colour to the highest constitutional office of the country which the people can never forget. Dr. Abdul Kalam occupied the office of the President of India in the year 2002 during the N D A Government soon after the unfortunate Gujarat riots that had exposed deep communal fault lines in the nation and when even his predecessor President K. R. Narayanan had taken up the matter with the then Prime Minister Atal Bihari Vajpayee. He was deeply perturbed to see the gross human rights violations in the state of Gujarat after the Godhra incident. The Atal Behari Vajpayee government selected him as its presidential candidate, the Congress lent him its support and he was elected with just a little less than 90 per cent of the valid votes. This is how he was elected as President. Soon after assuming the highest constitutional office, President Dr. Kalam visited riot-ravaged Gujarat over the objections of the government of the day and met the affected people. And almost from Day One he began to open up the presidency to the people. Soon he became the peoples’ President. He used to share peoples’ pain. He was the Thiruvalluvar-quoting scientist who became head of state, opening wider the possibility of the non-politician, and the outsider to the political system, presiding over it. Long before discontent with the political class would spill on to the streets of the nation’s capital in the form of the Anna movement and become the propulsive force for the meteoric rise of the Aam Aadmi Party, it was Dr. Kalam, perhaps, who answered the need, in cynical times, for the role model who had no axe to grind. He could quote from the Bhagwat Gita as from the Holy Koran. He had a rich knowledge of comparative religion. He was a true secular man who spoke directly, with child-like enthusiasm, to the young, many years before it had become fashionable to invoke and refer to India’s “demographic dividend”. He embodied a positive solution-centric approach that made people believe that despite the hurdles, the prejudices and the political turbulence, greatness was at hand — it just needed ignited minds and a Vision 20:20. He was a true supporter of advanced India. It was his vision to see India as a developed country. 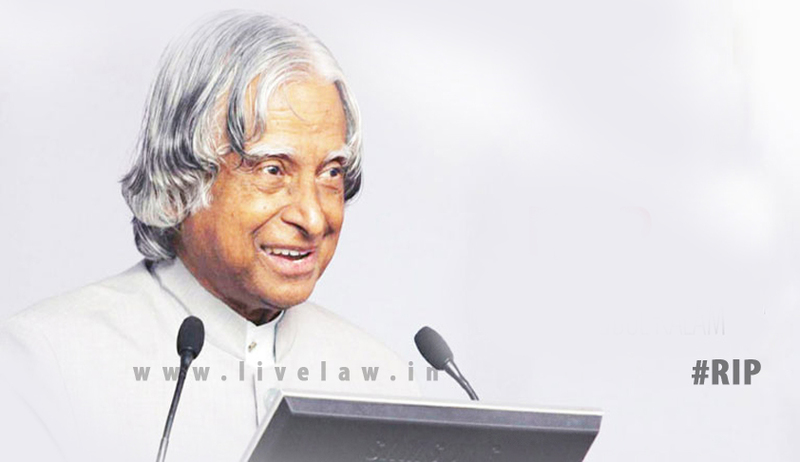 President Kalam acted successfully as a constitutional head of the Union Government for five years. Though he was not trained in Westminster Parliamentary jurisprudence, he acted as a citizen President. The limited powers which the office of the President of India has were truly utilized by him in national interest. After the 42nd Constitutional Amendment Act, 1976, the President has limited role in the decision-making process of the Union Government. Generally the President is bound to act on the aid and advice of the Council of Ministers headed by the Prime Minister in the exercise of his constitutional powers and functions except in a few areas where he can act on his own discretion. Even before 1976, this position was well-settled. But the President is not a rubber stamp or a cipher. No Government can take the President as granted. Thus when Prime Minister Manmohan Singh called me and said that the Cabinet had decided to recommend the dissolution of the Bihar Assembly based on the Governor’s concern at the dynamics of the Legislature what surprised me was that the Assembly had been in suspended animation for over six months. Hence, I asked the Prime Minister, how come this sudden development had taken place. The PM said he would call back. The second call came at 1 a.m. Moscow time. I discussed the issues and raised the questions with the PM and I was convinced that even if I returned the Cabinet decision, it would not matter because the decision would be somehow taken. I decided to approve the dissolution(A. P. J. Abdul Kalam, Turning Points-A Journey through Challenges, Harper Collins, Publishers India, 2012). When the Supreme Court started debating the issue many views emerged. I told the PM that the process by which I took the decision had not been presented properly in the court. I told him this once on the telephone and the second time personally. He mentioned that he would brief the lawyers to present the President’s action supported by the facts and sequence of events in Moscow and the number of times we had discussions before I finally approved the dissolution. Ultimately I was convinced that the lawyers did not put forth my side of the actions as expected. The Supreme Court verdict was with dissension. Of course, the Judges were supreme and they were placing the responsibility on the Governor and to some extent on the Government. After all the Cabinet is mine and I have to take the responsibility. As soon as the verdict was known, I wrote a letter of resignation, signed it and kept it ready to be sent to the Vice-President, Bhairon Singh Shekhawat, who was a seasoned politician. I wanted to talk to the Vice-President and hand it over. The Vice- President was away. Meanwhile the PM wanted to see me for some other discussion. We met in my office in the afternoon. After finishing the discussion, I said that I have decided to resign from the post of President and showed him the letter. I am waiting for the Vice- President to come. The Prime Minister was startled. The scene was touching and I do not want to describe it. The Prime Minister pleaded that I should not do it at this difficult time. He said that as a result of the furore that would be created, even the Government might fall. I had only one person to consult, and that was none other than my conscience. Conscience is the light of the Soul that burns within the chambers of our heart. That night I did not sleep. I was asking myself whether my conscience is important or the nation is more important. The next day I did my early morning namaz as usual. Then I took the decision to withdraw my decision to resign and not disturb the Government. This action would have taken place irrespective of which party was in power. As mentioned earlier, President Dr. Kalam acted as a constitutional head and followed the advice of the Council of Ministers headed by the Prime Minister in exercising his constitutional powers and functions as per the mandate of Article 74(1) of the Constitution. But at the same time he was fully cautious to his constitutional duty to protect, preserve and defend the Constitution and the law as per the mandate of his oath duly taken under Article 60 of the Constitution. Given the constitutional aura of the office of the President, he was fully loyal to the letter and spirit of the Constitution. Although in Bihar Assembly dissolution case in 2005 he acted hastily, he tried hard to convince the Parliament to reconsider the Office of Profit Bill in 2006. As empowered under Article 111 of the Constitution, he rightly returned the Bill to the Parliament for reconsideration on his own discretion. Had Dr. Kalam returned the advice of the Union Cabinet in 2005 in the Bihar Assembly dissolution case, it would have added more value to his profile. He was fully empowered to do so as per the proviso to Article 74(1) of the Constitution, added by the 44th Constitutional Amendment Act, 1978. But he easily gave in before the Government and an Assembly was eliminated by the monstrous Article 356 for political considerations. He had a good precedent to follow. His predecessor President K. R. Narayan had saved the U. P. and Bihar Assemblies in 1997 and 1998 respectively from untimely death under Article 356 of the Constitution. The President of India, as its first citizen, has the constitutional right and duty to interpose in public affairs of great importance. I am deeply honoured to pay my humble tribute to President Kalam by this paper. He was a true patriot and a great son of mother India. He was fond of meeting people particularly children and delivering educational lectures. He was a conscience keeper of the ethics in public life. He was a great supporter of human values and growth. His life is a lesson for us. He was a teacher throughout his life. “Teaching is a very noble profession that shapes the character, calibre and future of an individual…youth have a dream and also they have a pain. The pain comes out of their dream; they want to live in a prosperous, happy and peaceful India. This type of student’s environment ignites me and leads me to interact with young minds,” he said in the interview. He authored several books. May his soul rest in peace. Dr. Lokendra Malik, LL.D., Advocate, Supreme Court of India and well known author.